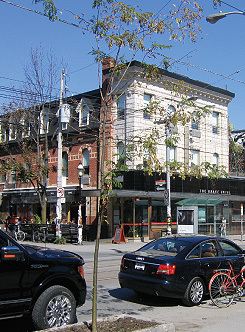 Beaconsfield Village is a newly sought after residential neighbourhood located along Queen Street between Ossington and Dufferin. It offers an eclectic mix of art gallerys, restaurants, bars, cafes, small clothing boutiques, one of a kind shops and basic convenience type stores. In this neighbourhood you will find homes circa 1880's and 1890's. Beaconsfield Street is the signature street in the neighbourhood. This street has been designated by the Toronto Historical Board for its historic collection of classic Victorian houses. Other home styles in this neighbourhood are Victorian row and semi-detached houses. Many of these houses have been extensively renovated and converted into two and three family dwellings. Please note that the schools listed below have very definite enrollment boundaries. Prior to buying you should contact the school you are interested in to confirm that they will accept children from the address you are considering moving to.